Wouldn't it be nice to get a single call from multiple APIs? Well, that tool exists, and the developers who created it need your help. 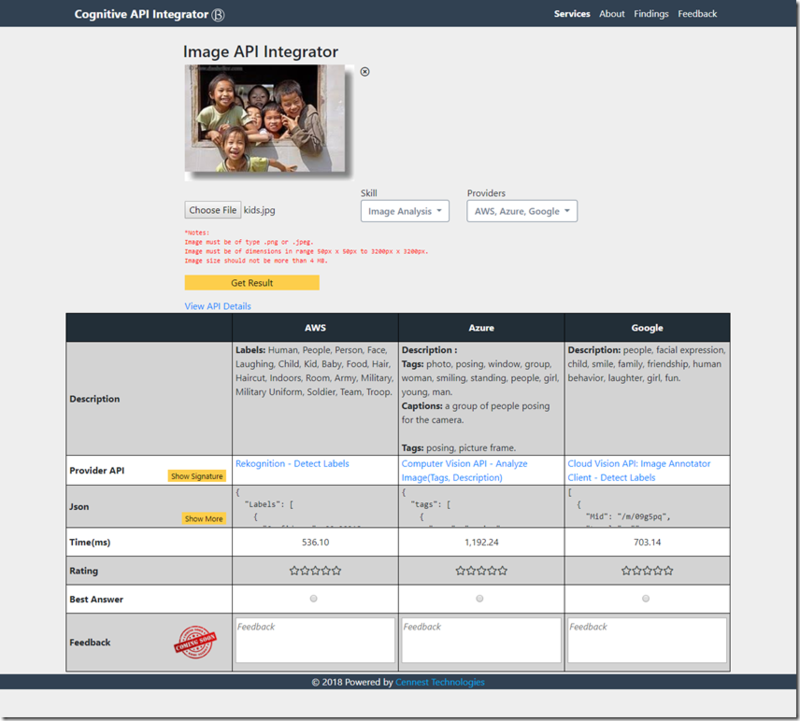 The Cognitive API Integrator is a free tool meant to be used by for developers, Engineering Managers, CIOs or anyone who needs to choose a Cognitive Service provider to build out a business service. Th Integrator aggregates cognitive services across major providers (currently Microsoft Azure, Amazon Web Services, and Google Cloud) and provides all the results against a single API call. A comparative view of the results at a single place will help choose which provider for each Cognitive Service makes maximum sense for their domain. The APIs currently do not add or modify the response given by the cloud providers. We are hoping that the community can join hands with us on this to help improve this service. Do scroll down at the bottom to see few of the ways in which we can work on this to improve it for the overall community. 1. As we continue to integrate with more providers and APIs, people who need to choose a cognitiveAPI (like developers, product managers, small business owners) can use this tool to check the response of various providers and make the best decision as per their data/domain. 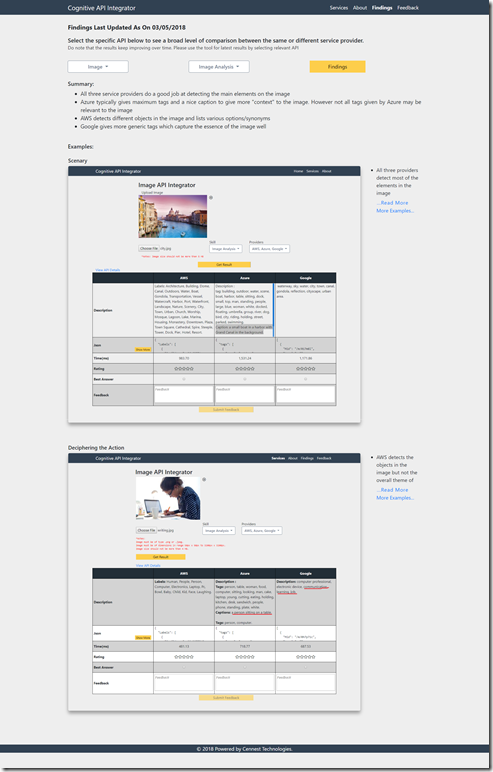 Example: The image below shows the image analysis response of Azure, AWS and Google Cloud for the same image. Based on the responses, the choice on the most appropriate response for their domain can be made. 2. In the " Findings" page, one can also look at the inferences that the community has drawn so far to help them validate their choice. 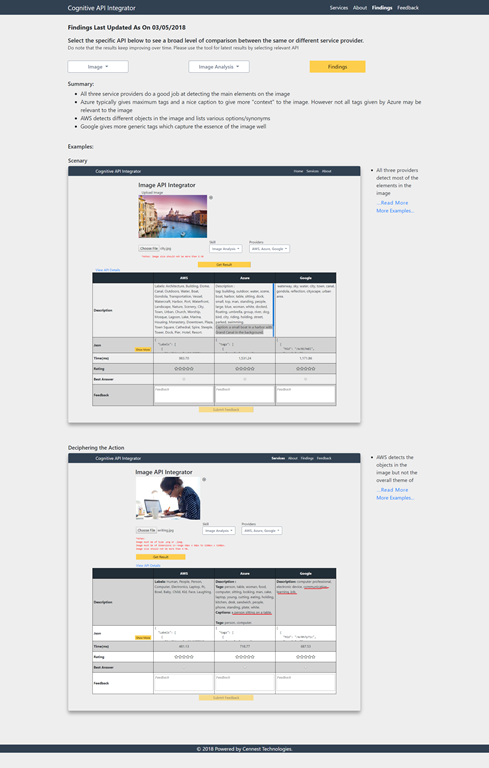 Example: In the image below, the current findings for the same Image Analysis API across multiple images as found by the community is given. In another post, we will outline our plans for the medium term and, given enough support from the community, how we can together evolve this for the long term. Please play with the app. Go through the inferences we have made so far in the findings section. If you see a pattern with a specific provider/API send us your inferences so we can validate them and put them up on our findings page. Published at DZone with permission of Anshulee Asthana , DZone MVB. See the original article here.